Data is all-important when it comes to successfully targeting your customers. There are many things that you can find out about them, even just from how they use your website. You can understand what kind of products they buy and what their browsing behavior is like. You can also discover their age, location, and perhaps occupation. Through social media or other sources of data, you can discover their other interests, whether they are a parent, what they search for, what they buy, and where on the internet they spend most of their time. All of this can be extremely useful. Behavior is, first of all, a very important factor. You need to be able to market your product in a place where your customer will see it. If you know that your customers spend a lot of time on Facebook, for example, then you may invest in advertisements on this platform. It is also important to know where they go when they look at your site. Do they head straight to a certain page, or come in through the homepage? Perhaps special offers and new products may be ignored if visitors are bypassing the homepage, meaning that you need to make them more prominent on other pages as well. What your customer desires is the key to knowing what they will buy. Your task is to sell them exactly what they want, even if only in a broad sense. For example, if someone is a parent, you may present your product to them as an asset because it will help them to be able to spend more time with their family. On the other hand, if your time-saving product is being sold to a young business owner who is single and dedicated to their start-up, then you might instead sell it to them as a product which will help their business to grow quicker. The product is the same - only the marketing message is personalized. It is absolutely essential to follow your customer through every part of their relationship with your company, and ensure that their needs are well met. 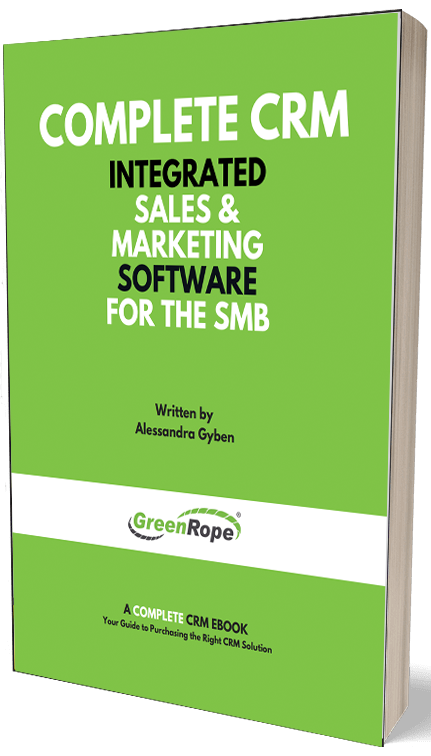 With a CRM like GreenRope you can set up marketing automation so that a customer receives an email after they sign up to your site, after they purchase something, and so forth. It’s also important to keep an eye on their experience as a whole. Having a central data hub for customer information means that you can check back on prior support requests, complaints, and orders to give them a thorough and detailed response in all communication. All potential customers will have objections about using your service or buying your product. Your job is to use the data to understand your customers and then answer those objections before they arise. You can, for example, run a survey to find out why customers did not buy on a particular occasion. Let’s say the young business owner feels that your service is too expensive for them. To combat this, market it to them in a personalized way as being something that will save them money over time and help to build better profits. Data can be used to significantly increase your sales if you know what you are doing. Give the right message to your potential customers in the right place, and support them through every step of their relationship with your brand, and you will find sales figures rising. This is a delicate process, and almost impossible to do without the proper use of data and a CRM. Once you get it right, your sales will go through the roof almost immediately.